After five years of infertility, Leanna and Jeff Landry’s lives were changed in 30 minutes. In that short time, the wife and husband found out they were candidates for embryo adoption and were in possession of six embryos. For people unable to conceive naturally but who want to become parents, we tend to think there are two options: going through fertility treatments or adopting a child. But there’s also embryo adoption — a lesser-known but increasingly popular way of starting a family. Embryo adoption isn’t for everyone, though: Some infertility stems from the fact that someone with a uterus isn’t able to carry a pregnancy to term, in which case embryo adoption wouldn’t work either. But for someone like Leanna, who had complications with endometriosis (initially misdiagnosed as polycystic ovarian syndrome) leaving her unable to conceive but able to become pregnant, embryo adoption seemed like the perfect solution. When people create embryos via in vitro fertilization, sometimes there are leftover embryos that are not implanted in a uterus. Traditionally, the options for those embryos are paying for storage to continue to freeze them indefinitely, donating them for research purposes or destroying them. But there’s another route: putting the leftover embryos up for adoption. Once an individual or couple has been approved for embryo adoption, the process that follows is the same as after traditional IVF. The embryos are implanted in the person with a uterus, who then gestates and gives birth. The resulting baby is not genetically related, but the mother does have the experience of pregnancy and childbirth. After five years of looking into options, Leanna came across a video on embryo adoption and knew right away this would be the right choice for them. The first donor profile Leanna and Jeff reviewed had biracial embryos (white male/black female), matching their own family dynamic. The couple left the meeting having adopted six embryos. “In that moment, we considered ourselves parents,” Leanna says. Leanna and Jeff’s story is featured in an episode of Family Portrait on PeopleTV – Time Inc.’s free streaming network. Each installment of the show provides a glimpse into the lives of diverse families across the country, putting the stereotype of the “typical American family” to rest. 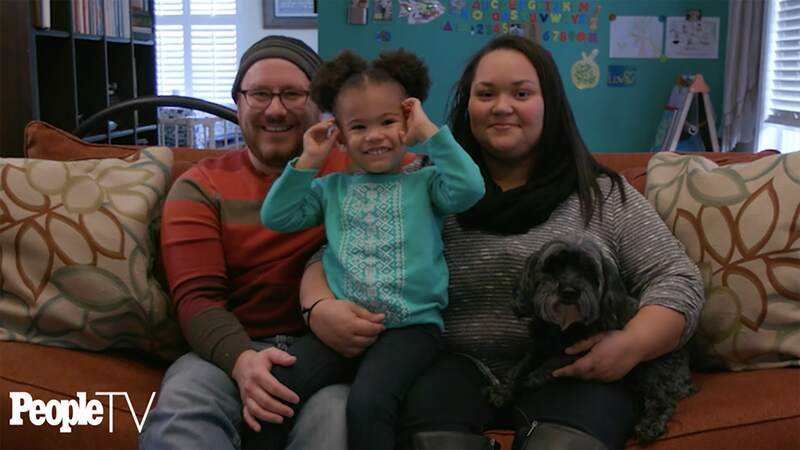 Leanna is adopted, and adoption was always on the table for her and Jeff. But as Jeff points out in the video, adopting a baby is easier said than done, with many hoops to jump through, not to mention costs ranging from $20,000 to $40,000. So when they learned of embryo adoption, Leanna says for them, it was “the best of both worlds” — getting to adopt and go through the process of gestating and delivering their child. Also, the costs were significantly less. The Landrys paid around $5,000 for embryo adoption. Part of the reason for the reduced price is that all the costs surrounding IVF have already been paid. Despite the promise of embryo adoption for those facing infertility, the Landrys found that many people — including medical professionals — were not familiar with it. Like a traditional adoption, embryo adoptions can be open or closed. Leanna and Jeff do not have any information on the identities of the donors aside from their medical history. After a successful pregnancy, Leanna gave birth to their daughter Olivia three years ago — an energetic child who loves to dance. The Landrys have taken their story public because they want other people to know about embryo adoption.